Held at the prestigious Royal Garden Hotel, I had the pleasure of attending the first BITES Live conference from H2O Publishing and hearing all about the latest trends and brands shaping the food and drink offerings on our high street. With over 2.27 billion active social media users every month, Julian Ross from Wireless Social shared that on average consumers spend 2 hours a day on social media. Social media plays an important role in how consumers interact with new trends – especially when it comes to food and drink from instagram food posts to researching restaurant reviews online before booking. The speed in which technology continues to develop means everything is now possible in an instant and our perception of time is getting shorter and shorter. Next day delivery was once groundbreaking, but now consumers expect so much more. – Amazon continues to push the boundaries with Prime offering delivery on many items in just 2 hours. – Waitrose offers customers a rapid delivery service with groceries at their door in 2 hours. – Chop Chop by Sainsburys goes even further delivering in an impressive 60 minutes to over 1.9 customers every week! The home is now the entertainment space with Netflix at our fingertips and takeaways only a click away. This means when we go out, it has to be worth it and of course instagrammable. Consumers are looking for new experiences and want to be able to share the fun they are having. Roy Westwood from Forward Associates explained “when you experience something amazing, you shout about it on social media – creating the halo effect”. This is why experiential hospitality is taking off, in fact in the last five years there has been a 17% increase in leisure activities including eating out, live events and holidays. However, Seb Lyall founder of Lollipop suggested that all concepts will only last 3 – 5 years before they need to innovate and change as consumers look for the next big thing. The Green Panel included Louise Palmer-Masterton the founder of Stem + Glory, Juliane Caillouette-Noble from the Sustainable Restaurant Association and Emma Hill, Head of Food, Health, Safety and Environment at CH&CO. They discussed the impact of food waste, one-use plastic and how eating less meat can have a positive impact on the environment. As an award-winning vegan restaurant, Stem + Glory is about to open a third location in London and has a passion for compassionate eating that doesn’t harm the environment. With a growing number of consumers following a vegan, vegetarian and flexitarian diets, Louise encouraged operators to consider how their vegan and vegetarian dishes are highlighted on menus. Investors from the BBC’s Million Pound Menu shared the top reasons they invest with Fraser Bradshaw advising he looks for passion projects focused on their core products with a real belief in what they do – in his words “foot-wide, but mile deep”. Tom Barton co-founder of Honest Burgers provided valuable insight into how others can build a brand. He shared how they started as a festival truck before opening a restaurant in Brixton and growing it to a successful chain with 28 sites. What was very apparent is the ethos of being honest has shaped every aspect of the business and plays an important role in the decisions they make. When a new site is opened they consider how to work with other companies in the area, by creating a local burger featuring locally sourced cheeses and breads. To celebrate each new opening an honest box is implemented where consumers can choose to pay however much they think the meal is worth, with the profits going to charity. Another thing that stood out is the consistent customer service available across every site which is down to the founders leading the inductions, meeting all new members of staff and sharing their beliefs of what the company stands for – ensuring the brand is delivered to their vision. 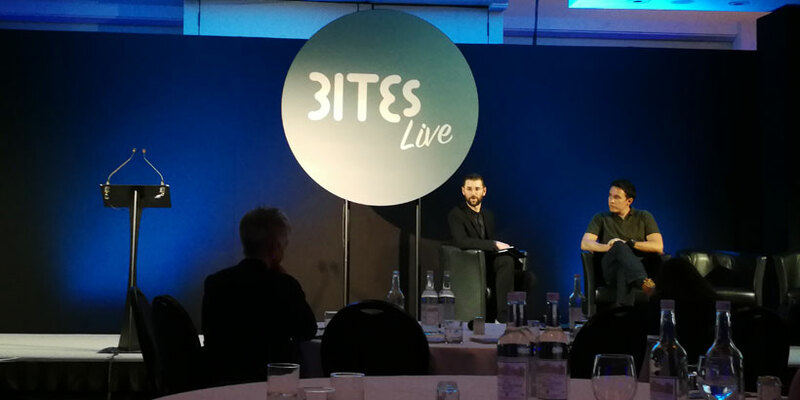 With a variety of speakers covering a host of important topics, it was an informative day and I am already looking forward to the next BITES Live. Well done Tristan O’Hana and the team at H2O on another great event.